Chris Weidman is a former four-time UFC Middleweight Champion and former two-times Ring of Combat Middleweight Champion. He is the only fighter who defeated Anderson Silva twice in a row. Chris Weidman is currently 34 years old according to his date of birth June 17, 1984. Chris Weidman is a BJJ black belt, but he prefers striking over grappling. On the distance, Weidman is known for amazing kicks and punches, and he fights like a true kickboxer. Chris Weidman’s strongest takedown is a double leg. On the ground, he basically does every single strike, and it is impossible to predict whether he will throw a punch or an elbow. He is a master of various submissions on the ground, and he has one of the technically most perfect D’Arce chokes in the history of UFC. Chris Weidman has amazing control on the ground with great transitions, which create problems even to the world-class grapplers. 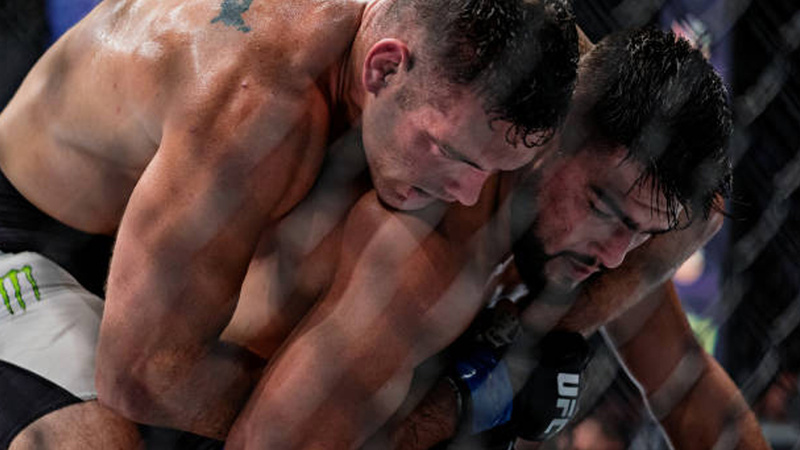 Weidman prefers punches and submission attempts off the clinch. Chris Weidman had his MMA debut on February 20, 2009, against Rubens Lopes. His first fight was his fastest victory in the career – he submitted the opponent via kimura after 1:35 in the first round. Chris Weidman had the score of 4-0 in Ring of Combat, before signing with UFC, with one victory via submission, two via TKO, and one via decision. The All-American won the Ring of Combat title in the fight against Uriah Hall, whom he defeated via TKO. He defended the title in the fight against Valdir Araujo via unanimous decision. 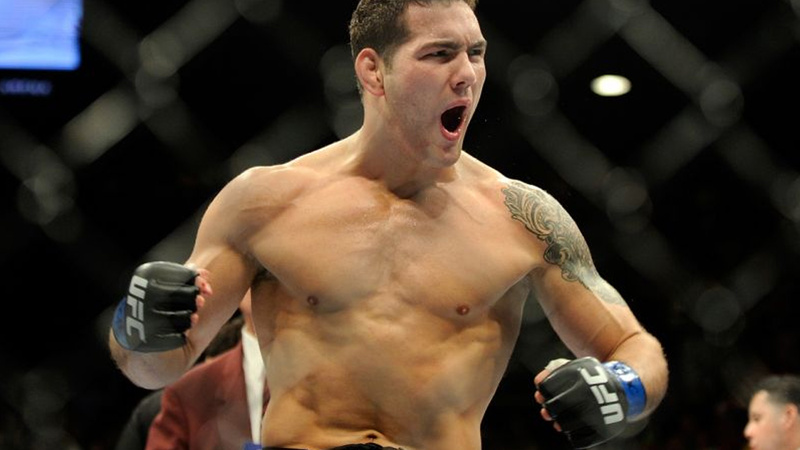 Chris Weidman made his UFC debut at UFC On Versus 3, on March 3, 2011, in Louisville, Kentucky. He defeated Alessio Sakara via unanimous decision. In the second fight at UFC 131, on June 11, 2011, The All-American earned his first Submission Of The Night award. He submitted Jesse Bongfeldt via amazing standing guillotine choke. The best submission of Weidman’s career was seen at UFC 139, on November 19, 2011, when he demonstrated what the perfect D’Arce choke is, submitting Tom Lawlor in the first round. 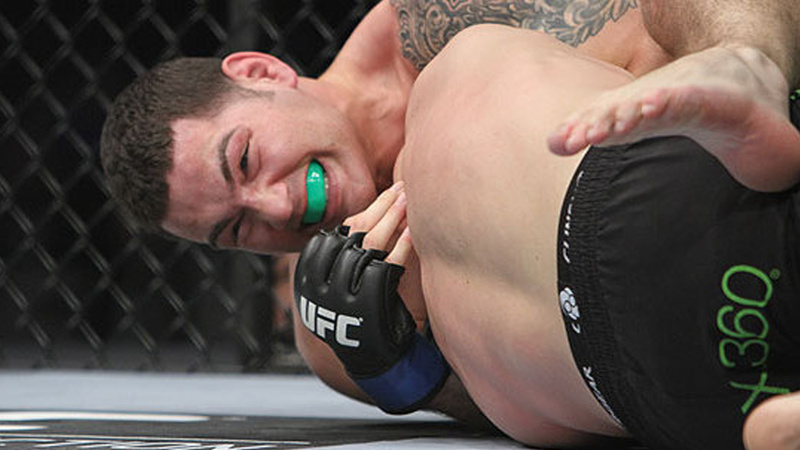 Chris Weidman faced Brazilian submission specialist, Demian Maia, at UFC On Fox 2, on January 28, 2012. Weidman won via unanimous decision. Weidman fought for the first time in the main event of the evening at UFC On Fuel TV 4, on July 11, 2012, in San Jose, California, against Mark Munoz. 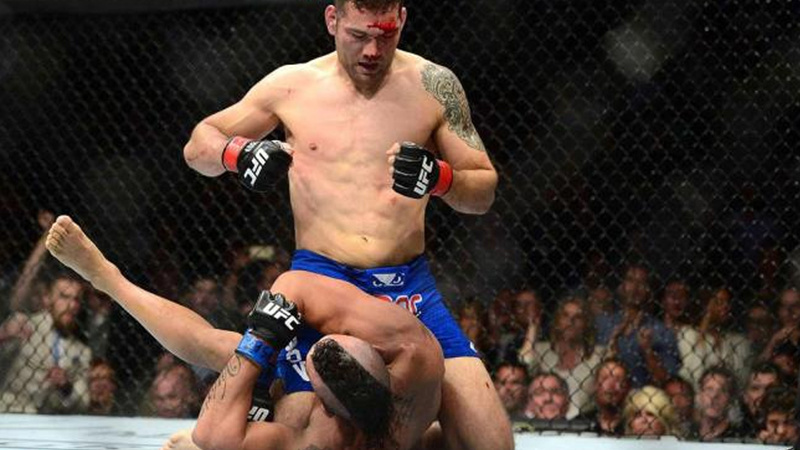 In the second round, Chris Weidman ducked under Mark’s right hook and countered him via spectacular right elbow. Munoz went down, and The All-American started delivering uppercuts and hooks on the ground. Weidman won via KO, earned his first Knockout Of The Night award. 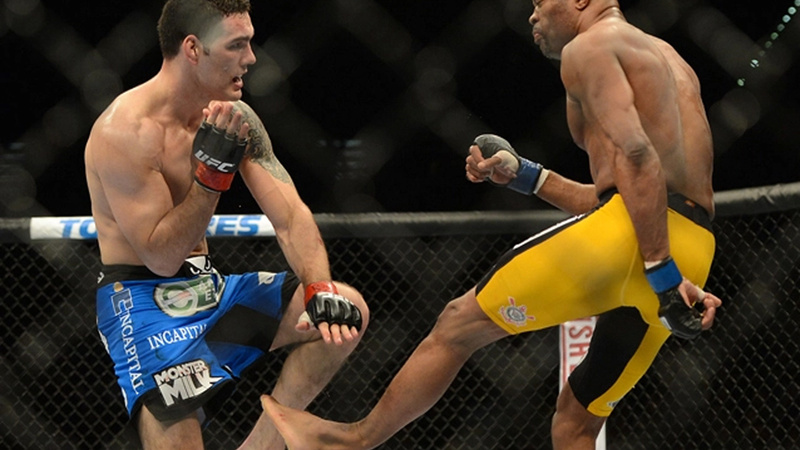 Chris Weidman faced Anderson Silva on July 6, 2013, in Las Vegas, Nevada. 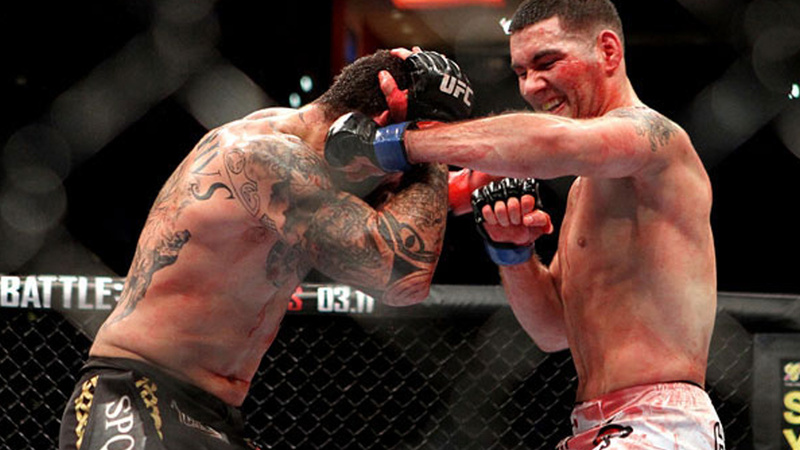 Despite being an underdog, Weidman attacked heavily from the beginning. Silva missed him in the second round via right front kick, and Weidman delivered strong left hook which rocked The Spider, then he connected with one more left hook and right cross. The fight was the main event of the evening. Silva was wide open, and Chris Weidman knocked him down with another left hook. The All-American continued landing shots on the ground, and the referee stopped the weight. Weidman von via KO, and earned his second Knockout Of The Night award. 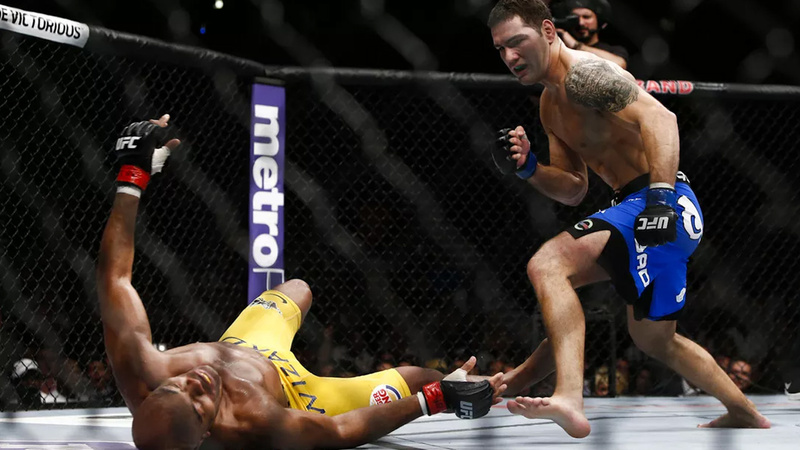 Chris Weidman Vs Anderson Silva 2 – Broken Leg! 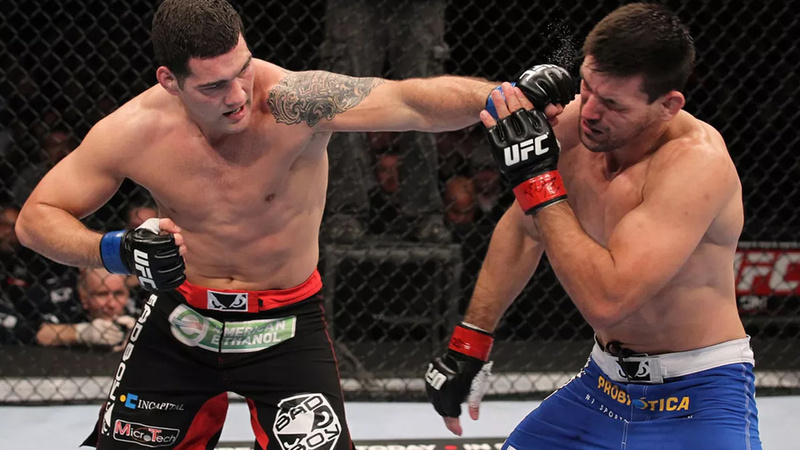 Chris Weidman defended the title for the first time against Anderson Silva at UFC 168, on December 28, 2013, in Las Vegas, Nevada, in the main event of the evening. 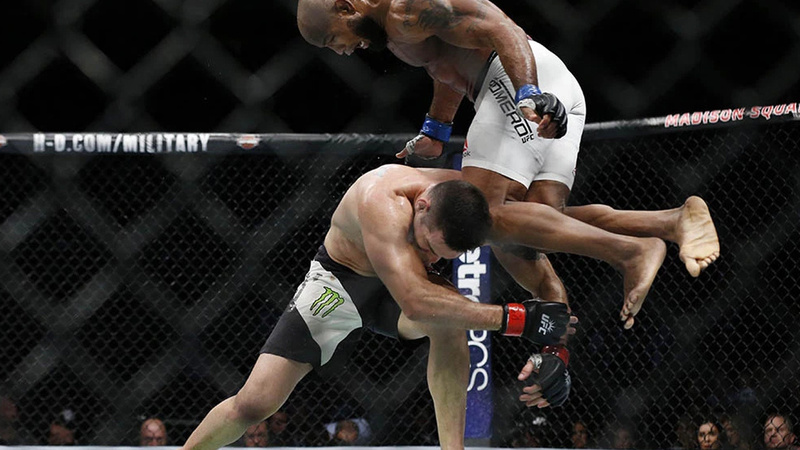 Despite Chris was the underdog again, Anderson Silva broke his left tibia and fibula after Weidman checked his left low kick. The All-American won via TKO due to a leg injury in the second round. The second title defense was the longest fight of Weidman’s career. He faced Lyoto Machida at UFC 175, on July 5, 2014, in Las Vegas, Nevada, in the main event of the evening. After five great rounds, Chris won via unanimous decision, earning his first Fight Of The Night bonus. 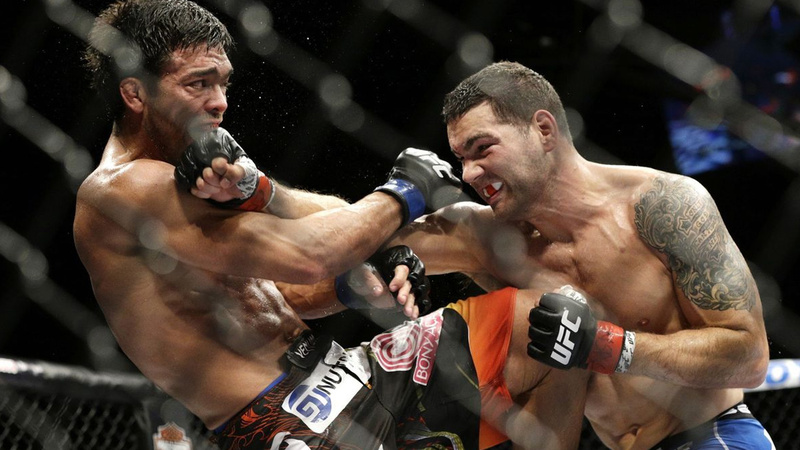 In the third title defense, Weidman faced Vitor Belfort at UFC 187, on May 23, 2015, in Las Vegas, Nevada. 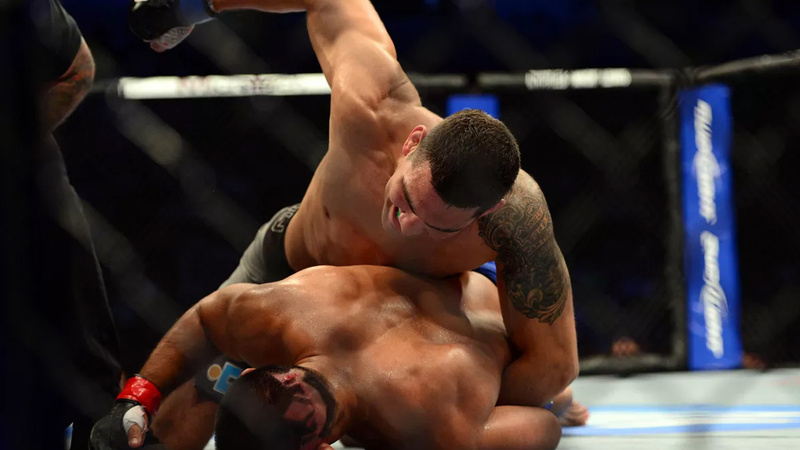 Belfort was delivering heavy punches as soon as the match opened, but Weidman survived the barrage and countered via takedown. The All-American quickly moved into the mount position and defeated Belfort via TKO in the first round. It was the Performance Of The Night. Chris Weidman faced Luke Rockhold at UFC 194 on December 12, 2015, in Las Vegas, Nevada. It was the main event of the evening. After a missed wheel kick in the third round, both fighters ended up on the ground. Rockhold took Chris’ back and transit to the full mount, landing brutal ground and pound. 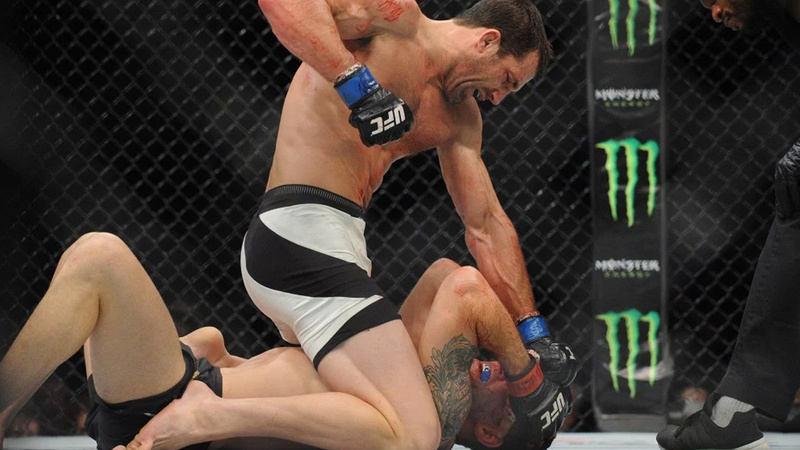 Rockhold repeated the same ground game in the fourth round, and Weidman was defeated via TKO. Chris Weidman fought Yoel Romero at UFC 205, on November 12, 2016. Weidman tried to take Yoel Romero down, but Romero countered via left flying knee and stunned him. After a brutal barrage of punches on the ground, the referee stopped the fight. Romero won via KO in the third round. Despite being a favorite against Gegard Mousasi, Chris Weidman was unsuccessful again at UFC 210, on April 8, 2017. 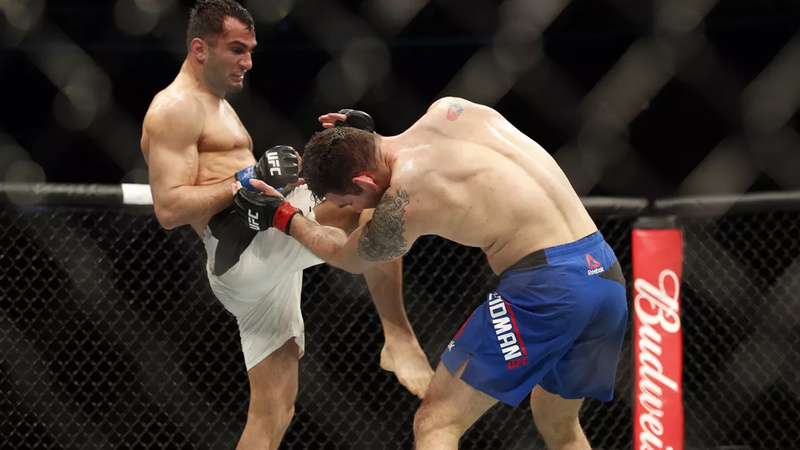 In the second round, the referee stopped the fight because he taught two Mousasi’s knees were illegal since The All-American was very near to the ground. But after review, the officials said the strikes were legal. Despite Weidman recovered, the doctor did not allow him to continue, and Mousasi won via TKO. Chris Weidman faced Kelvin Gastelum at UFC On Fox 25, on July 22, 2017, in Uniondale, New York. Despite he was dropped in the first round, The All-American won via arm triangle choke in the third round. After the fight, Chris was telling how difficult it was for him to listen to all the negative comments and doubts during his cold streak. Chris Weidman is married to his wife Marivi and they have three children.